As one of Hollywood's most productive and daring action stars, Tom Cruise's career has been filled with increasingly dangerous stunts that the actor has consistently insisted on doing himself. Cruise has reportedly always harbored a desire to test the boundaries of his physical ability, even in childhood while trying to emulate Evel Knievel, and he's got a litany of near-death experiences to speak of as a result of his very hands-on approach. These are just some of the many times Tom Cruise has nearly ended his life for the sake of filming a movie. Although Cruise is completely jazzed about the forthcoming sequel to Top Gun, he still remembers some of the insane prep work that went into portraying a "Maverick" fighter pilot in the original. "We did 9.5 Gs, very hard on my body," he recalled during a visit to Jimmy Kimmel Live. "I had a vomit bag right here, so in between takes I leaned down to quickly empty my guts in the bag. The second I did that, he pulls up. My head was literally on the ground from the pressure. I was pressed on the floor, holding my vomit. I kept going 'Bozo! Bozo!' I was choking, and he just kept pulling up and up." Indeed, the stunt work on Top Gun was so intense that it cost one pilot his life, and Cruise was almost a casualty too. As co-star Barry Tubb told The New York Post, "Cruise came as close to dying as anybody on a set I've ever seen." While Cruise was filmed cradling co-star Anthony Edwards' body in the water after Edwards' character "Goose" perished in the film, his very real parachute began taking on water at an alarming rate. "They were refilling the camera or something, and luckily one of the frogmen in the chopper saw his chute ballooning out. He jumped in and cut Cruise loose right before he sank. They would have never found him. He would have been at the bottom of the ocean." Cruise is widely regarded for taking studious instruction from stunt coordinators now, but there was one on-set tutor that felt the star didn't quite learn his lesson before getting into action. 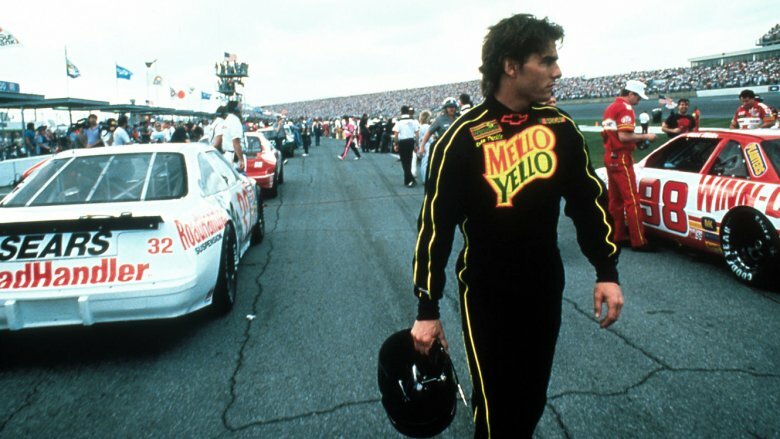 NASCAR vet Hut Stricklin revealed that Cruise didn't quite understand what he was being told before gearing up to film a racing scene in 1990's Days of Thunder, and spiraled out of control as a result. "I guess he'd seen guys on TV squirming back and forth left and right," Stricklin told For the Win. "He turned to the left, the car turned left. But when he goes back to the right… [crash]." Ultimately, Cruise was uninjured, but the expensive camera attached to his car was a goner. If Cruise's facial expressions looked especially true during the exploding fish tank scene in Mission: Impossible, that's because they were. As he told The Los Angeles Times, "There was a scene where we blow up these tanks, huge fish tanks, thousand-gallon tanks. First they're going to blow the tank [seven feet] behind me and then blow the tank overhead. And if I'm there, you know, I'm really gonna get hurt … Now there's a huge audience watching, and I don't want to get creamed. They count off, 'One, two'—my adrenaline is going, and on 'Two,' I hear the first explosion and it takes everything in my power to stay standing there, and then on three, I went, and it was a wall of water. So then the water rushes out and I've got to run faster than the water and chunks of glass are everywhere and I have to jump over a guy." Cruise said he ultimately walked away from the shot with a bruised ankle, but a stunt man suffered a gashed leg, so he refused to complain about his own little lesion. Cruise almost lost his head during the filming of one fight scene in The Last Samurai. 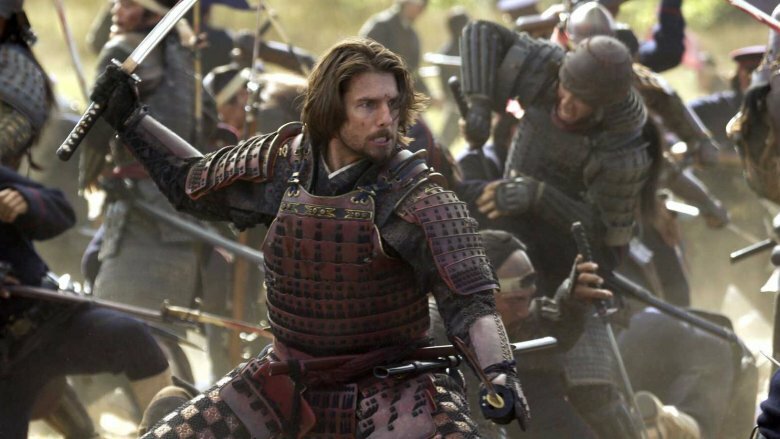 According to co-star Hiroyuki Sanada, he lost control of his weapon during production of the film in Taipei, Taiwan, and very nearly cost Cruise his life. "Tom's neck was right in front of me, and I tried to stop swinging my sword, but it was hard to control with one hand," he said (note: the two were also on mechanical horses during the take). "The film crew watching from the side all screamed because they thought Tom's head would fly off." Fortunately, he missed the mark—by just half an inch—and Cruise was spared. He's famously demanded that he be able to do even the most perilous stunt work on the set of any given high-profile blockbuster, but Cruise's co-stars aren't always quite as eager to take whatever comes their way during filming. 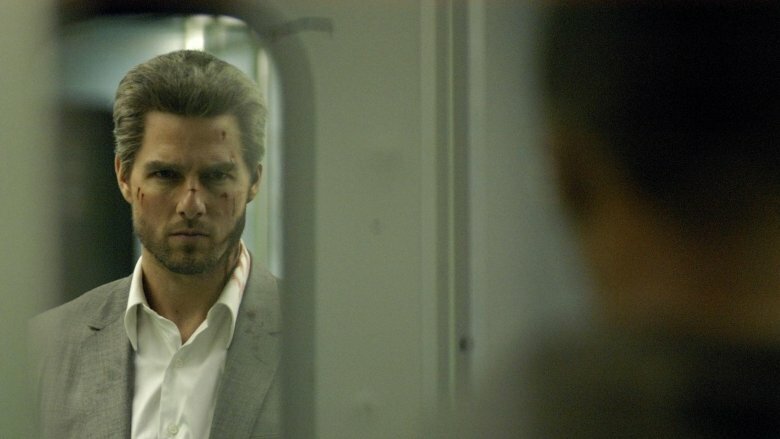 According to Jamie Foxx, Cruise almost met his maker while they were filming a car crash scene in Collateral. "I hit the gas, the cab goes straight head on into [Cruise's] Mercedes and the Mercedes lifts off the ground and goes off the set," he recalled. "They were so worried that I had killed my man. Can you imagine all that money bouncing around in the back seat?" Cruise himself admitted that the stunt had him "hitting the roof [and] down on the ground," but he was ultimately okay. For the opening scene to Mission: Impossible II, Cruise's character Ethan Hunt free-climbed a cliff and jumped 15 feet from one spot to another at Utah's Dead Horse Point—and Cruise had the benefit of just one tiny safety cable, much to director John Woo's chagrin. "The scary thing was, the cliff was 2,000 feet high. And there was no protection on the ground. The shot really scared me, so I was sweating and panicked," Woo admitted. "[Cruise] liked to do things that were impossible." Cruise, on the other hand, said he "felt confident with the team we had [and] confident that I could do it. That was the most fun that I had on the entire picture." Although director J.J. Abrams refused to allow Cruise to actually leap off of a building (a feat Cruise would later pull off anyway in a sequel) and insisted on shooting this Mission: Impossible III scene in-studio with green screen, the star still put himself in harm's way. As Abrams told CTV News, "There was nothing I ever asked him to do that he wouldn't do. There were things I asked him not to do because he was so willing to put himself physically in danger. I would be like, 'There's not a f***ing chance you're going through that window. If you get cut…' But he was always about the better idea." Cruise reportedly suffered cracked ribs as a result of his work on the film. The Burj Khalifa is credited with being the tallest building in the world, so it'd be pretty understandable if a guy like Cruise declined the opportunity to scale a building that'd have him suspended a quarter of a mile in the air. But he jumped at the chance to harness up with his sticky gloves and got to climbing, sideways running across the windows, and even more terrifyingly leaping and dangling from the side—all while being protected by just three thin cables to keep him from plunging to the ground. The stunt was so dangerous that writer-director Brad Bird admitted to waking up in a cold sweat, but all Cruise would reportedly say about the effort was, "I hope I don't fall." Ultimately, he did not. 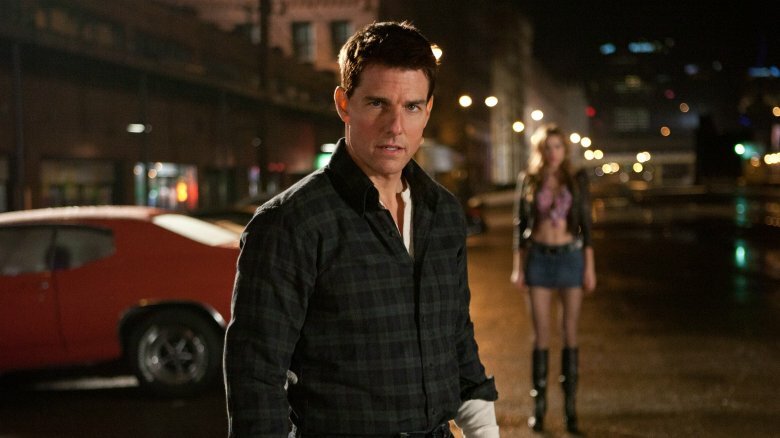 Cruise has walked away from many of his stunts unharmed, but he can't say the same for his work on the set of Jack Reacher—and the injury he sustained on the set comes with a uniquely oddball story. During an appearance on Late Night with Jimmy Fallon in 2012 (via E! Online), the actor revealed he got hurt during a crotch-kicking scene from the film … but not in the way one might expect. "There's a scene where I'm kicking a guy in the balls, the testicles," he explained. "It was a human being, [but] no testicles were injured in the making of the film. We had to do the take over and over again, and the first 10 times it was like 'Yeah!' After about 50 times in, my foot was swelling…I kept having to loosen my shoe." It's not exactly a life or death injury by any means—although his many (ahem) nutty stunts in the movie certainly proved that wasn't for lack of effort. Ever the thrill seeker, Cruise insisted on riding a motorcycle at high speeds through a rocky mountain plain for Oblivion—and when he wiped out during one take, it could've ended a lot worse. In behind-the-scenes footage from the shoot, Cruise is seen losing control of the bike as it careens down a slope, and although the back wheel of the vehicle continued to spin between his legs, he tumbled off and stood right back up, assuring the production crew he was fine. "He junked the bike but he was in full control of the situation, and his agility basically saved him," said Robert Alonzo, second unit director on the pic. Cruise added of his effort, "I had a blast riding that." 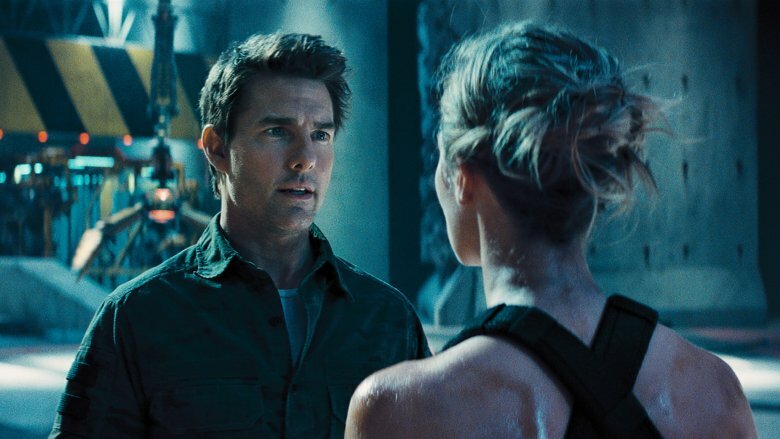 During production on Edge of Tomorrow, Cruise's co-star Emily Blunt was certainly impressed with his willingness to step up to the plate when it came to dangerous shots, telling Conan, "He really does everything and wants to do everything even if the stunt guys and the producers are like, 'Please don't do that.'" Cruise's enthusiasm for doing his own stunts inspired her to give it a shot, too. "We were driving this crazy old car with a trailer behind it, and the stunt guy was like, 'I want you to go really fast down the pass and take a really hard right and I want the trailer to swing out behind you, so get it moving,'" she recalled. "We do the first take, it went really well. Stunt guy came over and was like, 'Okay, just do it again, and try to do it even faster.' I was like, 'Okay, no problem.' We start—I tear down this path, and Tom is being very quiet, and suddenly I hear him under his breath as I approach the right-hand turn, I hear him going, 'Brake, brake brake' … I left it too late and drove us into a tree. And I almost killed Tom Cruise." You might think hanging off a moving plane might be one step too far for an A-list actor like Tom Cruise, but no—he was all for making the shot happen himself, and volunteered to hang off the side of an A400M aircraft to ensure that the image of his character in motion was more realistic than any green screen effect. And while it was ultimately a success, he didn't walk away completely unharmed. "While we are going down the runway, we're worried about bird strikes, any kind of particle that the propellers could pick up, any kind of stone," he told USA Today. "I remember I got hit by a stone that was so tiny, you cannot believe. I thought it broke my rib. Lucky it went to my vest and not my hands or my face; it would have penetrated and gone right through." It's also fortunate that Cruise has good lung capacity, because he was also required to hold his breath for six minutes underwater during filming. Of the many injurious and death-defying stunts Cruise has been a party to, his work on the set of The Mummy reboot has to be the strangest. The actor admitted to USA Today that while riding in a helicopter 2,000 feet above the Namibian desert, he willingly hung off the side so he could snap a daredevil selfie. 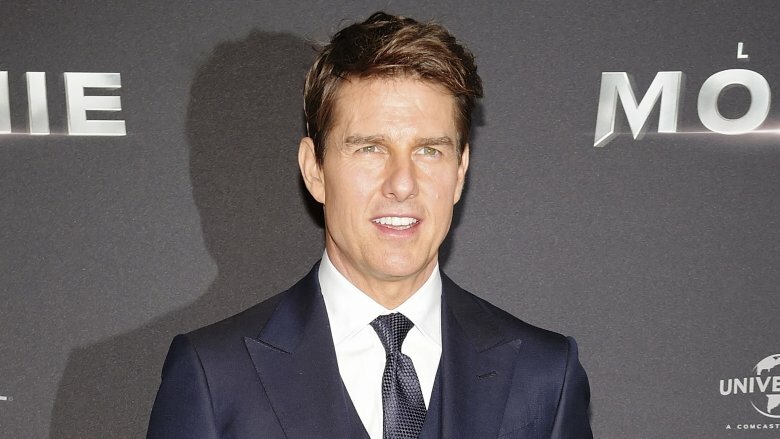 Cruise also convinced filmmakers to let him do multiple stunts for the film, including driving a high-speed vehicle, having his head slammed into a wall several times, and careening into a stunt bag. In the most hurl-inducing moment, he agreed to be filmed in a zero-gravity plane stunt that involved an airbus being hurtled into the sky. The stunt was done a whopping 64 times, and while director Alex Kurtzman admitted there were a lot of upchuck reflexes going wild, co-star Annabelle Wallis said Cruise never lost his lunch during the shoot. Respect. Although details about the sixth Mission Impossible installment are still scant, we can count on some more bonkers stuntwork. "There's some stuff that we've done a lot of training and testing to see if it's even possible," Cruise promised during an appearance on The Graham Norton Show. "There's always another mountain … it's going to be really wild. Look, if we get it, I think it would be very thrilling for an audience." Set-watchers in Paris got a taste of the crazy to come when onlookers witnessed Cruise riding a motorcycle through the city streets—without a helmet—as it crashed into a car and sent him flying into the air (on a harness). 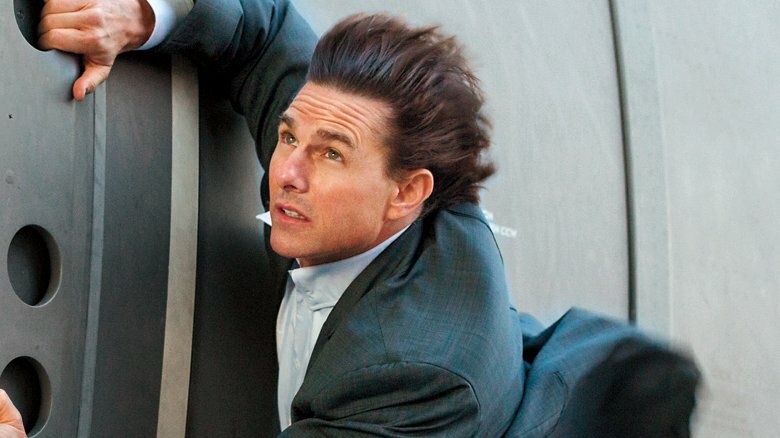 Through several takes, he walked away unharmed—because that's what Tom Cruise does.